Do you know what to do when somebody starts bullying you? School bullies make Hanner Flynn's life miserable. Hanner want to be normal. But she's different. She doesn't have a mother and father like everybody else or live in a "real" home. Her home is a converted storage shed she shares with her aunt who manages a self-storage yard. Hanner hates where she lives so she spends a lot of time in her "secret room" in the local woodsy park reading mystery books. When she decides to turn detective herself, she discovers some of the oddball renters at the self-storage are hiding big secrets! 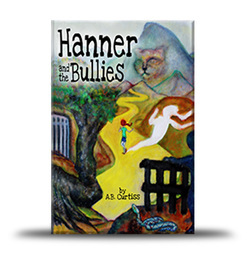 Drawn into the dangerous mystery of the cats-with-no-eyes that threatens the whole town, and a battle to preserve "her" park, she finds the courage to confront her school bullies with an ingenious plan. Hanner Flynn couldn't stop thinking about the nasty song the popular kids made up about her. She hated school. Why was everybody so mean? Why were they whispering all those lies behind her back? Hanner could hardly wait for the dismissal bell-to grab her bike and get out of there. She stopped by the park on her way home, leaned her bike against the fence, and walked with head down and heart racing into the playground. Sitting on one of the little kids swings she tried to calm down. She twisted slowly in the swing, her shoes making circles in the dust. Then she saw them. The same two boys that made up the embarrassing song had just pulled up on their bikes. They saw her, too. She couldn't take anymore. She had to get away from those bullies. She jumped off the swing and bolted toward the woods behind the park. When she looked back the two boys were chasing her. But Hanner could run fast! And she knew her way past the sticker bushes. She knew a lot of things about the woods that nobody else knew. She raced hard for a few minutes then paused to listen. Not a sound. Good. She made her way downhill following a small animal trail in the thick brush, squeezed through the secret passageway she had discovered between two giant boulders, and shouldered herself behind a thick ridge of eucalyptus trees. SAFE! In her own secret place. They'd never find her here. A white station wagon barrels up a dusty, two-lane road into the high desert of southern California. Intent on his dark thoughts, the driver ignores grand vistas of sandy mesas, granite cliffs, and barren hills dotted with large, smooth rocks that seem to have been scattered by giant children tossing boulder-sized pebbles. Up, up, up, he swerves the car around the seemingly endless twists and turns of the mountain road. But then, just over the crest of the last uphill climb, a spacious valley suddenly spreads out below him. It is an oasis of greenery cupped within surrounding gray hills. The driver has reached his destination-the town of Hidden Valley. Early prospectors found gold here in the valley's deep canyons and rushing mountain creeks. By 1860, a mining town prospered, attracting its share of the greedy, the ne'er-do-wells, and various con men of dubious persuasions. The man in the white car is a modern version of the dubious persuasion type. He has yet to meet his match. But he hasn't yet met Hanner Flynn. When Hanner Flynn moved to Hidden Valley in the summer of 1973, its mining days were a distant past. Claim-jumpers and prospectors no longer hid their secret treasure from one another. The place seemed as ordinary as any small town could be. But Hidden Valley still had its hidden treasure-and its secrets! Hanner, the new girl in school, was just the kind of fireball to spark them all out into the open. The freckle-faced, energetic, redheaded tomboy was not only the tallest girl in her class, she was also the skinniest. She was the smart, spunky go-getter who rode her silver bike all over town, and the one who was secretly doing something very dangerous. Hanner usually avoided riding her bike around Dead Man's Curve. It gave her the creeps. Even on the sunniest day, it was dark and cold. Thick branches of ancient sycamore trees arched over the road like a dense tunnel, their enormous scarred trunks hugging the dirt banks on both sides. One venerable old tree had a deep red gash in its trunk. Hanner thought it was rust, but her friend Luke Grasso insisted it was blood, and that Dead Man's Curve was the scene of an old murder. Steep Hill was scary, too. But Hanner couldn't avoid it because it was the road she took to school. It was practically straight up and down. Steep Hill wasn't really the name of the street, but that's what everybody called it. Luke was the only one brave enough to race down Steep Hill with both hands off the handle bars, his arms raised high over his head. How could Luke keep his balance like that at breakneck speed? Hanner was astounded, and a little jealous. She liked being the one who could amaze everybody. If Luke could do it, why couldn't she? Why couldn't she be brave like that? And then wouldn't she just surprise everybody! Especially Luke. Hanner was thinking about that on her way to school when she heard Luke call out. "Hanner! Hanner! Hey! Wait up!" Hanner stopped so Luke could catch up. He screeched to a halt, a bit breathless. "We'll be late if we don't hurry," she scolded. "Want to... hear something... really awful?" "Not too awful!" Hanner's blue eyes narrowed as she brushed aside a wisp of bright red hair straying from her pony tail. She glared suspiciously at her friend. "Someone killed the Jasons' cat last night. And, Hanner, when they found him, that cat had NO EYES!" "Oh no! That big, fluffy white cat? I know that cat! Who could do such a terrible thing? "Really awful, right!" "Why would someone steal the cat's eyes?" "Worse than that," Luke continued, "Mrs. Jason told my mom it was the second cat killed like that on our street. So it must have been the same person that did it." Hanner felt a cold shudder arch up her back. "Both cats had a red bandana tied around their neck," he added. "And that was nailed to a tree. Weird, Hanner. And no eyes!!!" "Way creepy." "That's what I'm trying to tell you. Mrs. Jason said that when you have some crazy lunatic like that running around, no telling what they'll do next." Hanner put her hands over her ears. "No! No! Stop! It's too awful. I don't want to hear it."